A Pennsylvania landscape painter living in Allentown, John Berninger is described by art writer, Geoff Gehman, as being in the "outer ring of the New Hope School." His career was devoted to depicting his region in realist-impressionist style, especially snowscenes and landmarks such as Meyers Bridge in Allentown. Berninger studied with Orlando Gray Wales, Arlington Lindenmuth and Walter Emerson Baum, and then was an art instructor at the Kline-Baum School in Allentown. In 1934, he was selected as one of four students of Baum into the Circulating Picture Club of the Philadelphia Art Alliance, and two years later, he became Curator at the Allentown Art Museum, which had just been founded by Baum. Berninger's wife, Mabel, assisted him and served as museum curator and secretary of the Circulating Picture Club. In 1939, he joined the jewelry store, Wuchter and Berninger, as a partner, and advertised his paintings by placing them in the store's window. A local publisher and art enthusiast, Robert Rodale, saw his work there and years later, in 2004, held the first major exhibition of Berninger's artwork. 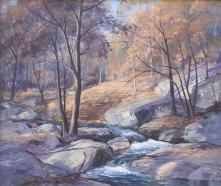 The next year, Berninger's work was represented in the Allentown Museum exhibit, "Allentown Impressions: Views of City Parks". A frequent painting companion was Karl Buesgen, local landscape painter and musician. They spent nearly every Saturday together, painting and talking, and died within a few months of each other in 1981.